Fantasy owners are picking up and dropping relievers at a rapid pace so far this season. Many owners are speculating on which guys can go on a run and grab a few saves on the cheap. There is an increase in the number of pitchers who are getting saves on any given night (57 through Friday’s games). Because of this, waiver wire activity is at a fever pitch. Closer rankings can be just as volatile. A solid option one week may be on shaky ground the next. I will continue to tweak these rankings each week, taking into account usage as well as a variety of other factors. Here are my Week 4 closer rankings and bullpen depth chart. Baltimore has not had a save in a week, as they’ve lost four straight and eight of their last ten. Mychal Givens is still allegedly the closer, but he has yet to record a save in 2019. Virtually every pitcher with a path to saves has value, especially in deeper leagues. Givens is not a safe bet going forward. That goes double for any other Orioles reliever. Matt Barnes has not recorded a save since March 29 and has pitched in the seventh inning in three of his last four appearances. That usage means that Ryan Brasier is the preferred option for now. Brasier is available in more Fantrax leagues than Barnes is. That needs to change immediately. The Yankees have experienced a similarly slow start that was punctuated by a series sweep at the hands of Houston. Like Boston, New York also figures to get right at some point, but Aroldis Chapman has lost some velocity and continues to struggle with command. Chapman is still a top-10 closer, but his grip on top-5 status is tenuous. Jose Alvarado has had some control issues in recent outings, but he has bared down when he’d had to and has still yet to allow an earned run. If his control continues to get away from him, Diego Castillo may get an extended look. For now, Alvarado is on solid footing, with Castillo serving as an excellent setup man who can vulture the occasional save. Ken Giles blew up on Thursday night in Boston, but hopefully, that was an isolated poor outing. Giles had been stellar through his previous six appearances, carrying the gains he made in 2018 into this season. I am still confident in Giles as a low-end RP1 in fantasy this season. Brad Hand has bounced back after failing to hold Trevor Bauer’s no-hit bid last week. Hand has needed just 18 pitches to retire eight hitters over his last two appearances. He is an elite option in all formats. Alex Colome has allowed a run in back-to-back outings, but his handle on the closer’s role does not figure to be threatened for the moment. The bigger question mark for Colome is simply opportunity. The White Sox are just 4-8 and are not expected to contend in a weak AL Central. Shane Greene has surprised everyone by jumping out to a league-leading eight saves through Detroit’s first 15 games. Greene posted a 5.12 ERA last year but has yet to allow a run in 2019. In 2018, he never went eight consecutive appearances without allowing a run. He did have a six-week stretch in 2017 where he did not allow an earned run. Outside of that timeframe, his ERA was 3.51 in his remaining 2017 appearances. That is what owners should hope for going forward – a mid-3.00 ERA with a relatively firm handle on the job. In 2019, that is quite valuable. After touting Ian Kennedy and Wily Peralta recently, manager Ned Yost went back to the Brad Boxberger well on Wednesday and Thursday. Predictably, the Royals ended up losing both games. Boxberger is a dumpster fire. He has two losses, a blown save, an ERA over 9.00 and a WHIP over 2.00. The Royals are 3-10 and do not have a reliable closer. There are three reasons to own anyone mentioned above or speculate on another Royals reliever. 1) You are in a very deep/competitive league where every save is vitally important. 2) You are a Royals fan and a homer. 3) You are a masochist. I myself am #1 and #3, so no judgment from me. Twins manager Rocco Baldelli seems to prefer Blake Parker in the closer’s role, but Taylor Rogers and perhaps even Trevor May are still in the fold. May was the one that fantasy owners projected would close before the season began. He is also still the most popular of the trio in Fantrax leagues. All three pitchers have been effective and the Twins are sneaky good. Unlike the situation in Kansas City, this is a situation owners should gravitate toward. Roberto Osuna has picked up three saves this week and is locked in. Ryan Pressly picked up the save in Houston’s series finale against the Yankees with Osuna unavailable after pitching on back-to-back days. Pressly was one of the best relievers in baseball once he arrived in Houston and has picked up right where he left off this season. He is a very worthy stash in all formats who would immediately push for top-10 value were something to happen to Osuna. Cody Allen made the most of a couple of recent opportunities and seems to be on solid footing for now. Hansel Robles got the save in Allen’s absence on Wednesday and looks to be the next in line. File under “Big, if true”: Blake Treinen is an elite closer. He already has a handful of saves and 14 strikeouts to his credit. Joakim Soria and Lou Trivino would be the options for those speculating on life without Treinen in Oakland. Six Seattle relievers have gotten saves through two weeks. I cannot pretend to predict how this is going to shake out, but this is obviously a situation worth paying close attention to. The Mariners are 13-3 to start the year. That pace cannot hold, of course. But saves could be plentiful and are likely to come from a variety of arms. Anthony Swarzak has seen the most traditional closer usage, and he is still available in nearly half of all leagues. Jose Leclerc had a rough stint in the desert this week. He blew a save and took the loss on Tuesday, giving up three runs including a walk-off home run to Jarrod Dyson. Yes, that Jarrod Dyson. Leclerc followed that performance by arguably pitching worse the very next night. Leclerc faced five batters and retired only one. He allowed one hit, one walk, and hit two batters. Luckily for him, HBP doesn’t count against a pitcher’s WHIP. (They should.) Kyle Bird then cleaned up Leclerc’s mess and stranded all three of his baserunners. Leclerc should be fine, but his lack of control can cause these kinds of hiccups throughout the season. A.J. Minter got his first save of 2019 on Monday, but that may have just been Atlanta not wanting to use Arodys Vizcaino on consecutive days. This scenario is likely to repeat throughout the year, so both guys will have their days in the sun. Miami sits at 3-11 through Friday’s action, and both Sergio Romo and Drew Steckenrider have been bad. This is basically “Royals Southeast’, as Adam Conley may also figure into the mix at some point. Hopefully, you have better options. Edwin Diaz is once again striking out over 40 percent of hitters this season. Neither saves nor punchouts will be hard to come by for Diaz in his first year in New York. The Phillies are playing well, but you wouldn’t know it by the year-to-date numbers of David Robertson or Seranthony Dominguez. Neither pitcher has gotten a save yet. Instead, both Hector Neris and Pat Neshek have tallied saves recently. I still think Robertson is the reliever you want to own in Philly, but Neris quietly had a really good 2018 and may be a factor in the ninth inning should Robertson and Dominguez continue to struggle. Sean Doolittle is not among the 57 pitchers to record a save in 2019. But he has not allowed a run to cross the plate and he leads the National League with three wins. All of those anomalies will regress as the season rolls on, and Doolittle should maintain top-10 closer value. Pedro Strop finally got off the schneid and picked up his first save on Thursday. Brandon Morrow is scheduled to throw to live hitters shortly and could be back in about a month barring any setbacks. Strop has that time to audition to keep the job all year long. On Wednesday night, Raisel Iglesias became the 50th pitcher to record a save in 2019. I do not think it is a fluke that Iglesias has struggled to return value so far this season. He is still the preferred option in Cincinnati, but I think his ceiling is lower than some of the other closers who were drafted in the same range. 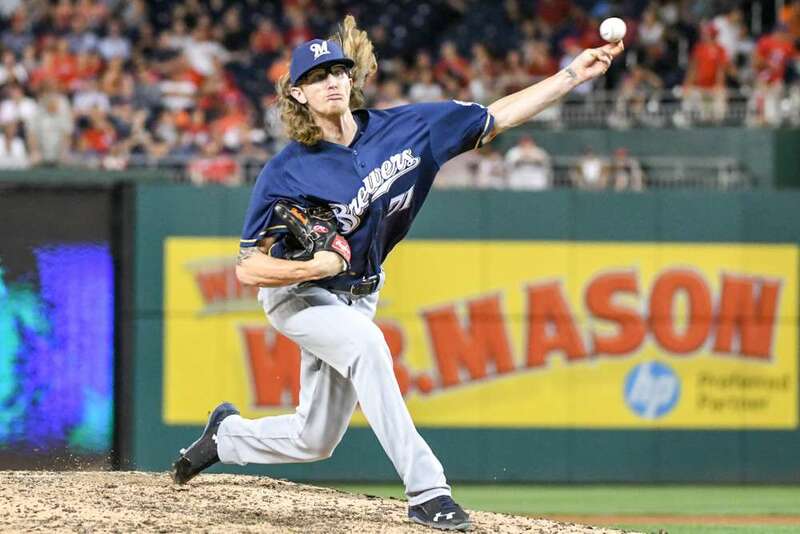 On one hand, Josh Hader has five saves, 15 strikeouts, a 0.00 ERA, and a 0.56 WHIP. But on the other, he too will lose some saves because of how he is deployed. On Sunday, manager Craig Counsell brought Hader in with one out in the seventh inning. Hader retired all eight batters he faced and got the save, but needed 36 pitches to do so. He was then unavailable for the next two days as a result and did not pitch until Friday. Hader faced similar circumstances in that outing. He threw 37 pitches in recording “just” four outs, and was unable to close the game out for Milwaukee. He will now likely be unavailable on Saturday as well. Owners will obviously gladly take the whole package but must be aware that he is going to lose some saves because of his usage. Felipe Vazquez has not allowed an earned run this season and has not walked a batter over his last five appearances. He is a top-shelf fantasy closer in all formats. Jordan Hicks has recorded three consecutive hitless and scoreless appearances since a blown save on March 31. The fireballer only has two saves to show for his efforts, but those opportunities figure to increase in short order. The Diamondbacks seem to recognize that less is more with middling closer Greg Holland. Holland is almost exclusively being used in the traditional closer sense, which should give his owners at least a little hope. He has come through so far, allowing just two baserunners in four scoreless innings. Holland will probably hit a wall at some point, and Arizona doesn’t figure to be very good. But for now, Holland is a decent option. Wade Davis still hasn’t gotten a save in 2019, as the Rockies are off to a brutal 3-11 start. He has also walked a batter in all four of his appearances. But he has not allowed any runs and save changes should come around for the veteran eventually. Kenley Jansen has gotten off to an excellent start, despite having not recorded a save since last Saturday. Jansen has allowed just one earned run and three hits in 6.1 innings. He continues to be an elite closer in all leagues. Kirby Yates has been on fire lately. He leads the National League with eight saves and has struck out at least one hitter in all nine outings thus far. San Diego is off to a fast start, though it helps that 80 percent of their games so far have been played against the Giants and Diamondbacks. That is not to suggest that Yates will not be productive. But he is probably going to slow down at least a little at some point. Will Smith has converted all four of his save opportunities so far and will continue to be a solid closer for as long as he remains in San Francisco. An unrestricted free agent after the year, Smith could be dealt if the Giants fall out of contention before the trade deadline. Great article. If I drop Robertson who would be a better pick up in Castillo from Tampa or Trevino in Oakland. I’m in a deep 14 team 23 man roster spot league with Diaz strop and Jansen as my closers. I unlike you do not think Robertson is going to get enough saves to warrant his ratios. So if I were to drop Robertson who would you rather. I was thinking Trevino in the likelyhood Oakland flips their closer by mid season? What are your thoughts? Or do you think I am over thinking and just leave Robertson on my bench until this all figures itself out. Thanks for the feedback and the question. I would personally keep Robertson because I think he’ll turn it around, but I can understand being nervous about it. If I had to pick, I would definitely take Castillo over Trivino. Oakland should stay in the hunt for at least a Wild Card so I do not expect them to trade Treinen. Castillo will already probably get 10 saves and has the potential for many more if Alvarado falters at some point.